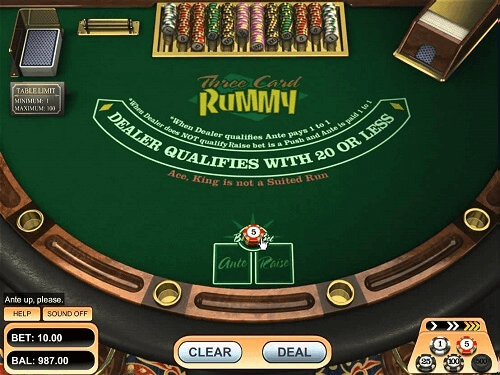 The game of 3 Card Rummy is one of the most easily enjoyable casino table games online. The game was modified from a game called “casino brag” to this version that allows players to bet against the house. Online 3 Card Rummy quickly became popular because of this feature. It is the same feature that made it one of the first casino games to go online. This is because there is no human interaction required and the game can be played against a machine. The first and obvious thing that is needed for someone to play 3 Card Rummy online is a fast and secure internet connection. Once this requirement is met, the next thing is to find a trustworthy casino. This is easier said than done. Casino ZA has some tips on how to find the safest casino to play at. When this is done deposit real money and begin to enjoy this awesome game. The game is played against the dealer as previously highlighted. A standard deck of 52 cards is used in the game. There are no wilds in the game. 3 Card Rummy has two modes of play. The first is the Ante Bet and the other is the Raise Bet. Before the cards are dealt on the screen the player needs to place a bet. They do this by first selecting a chip size to play with. After selecting the chip size the player places an Ante Bet. Three cards are dealt face up to the player and the dealer also gets three cards but his will be facing down. When a player thinks they have a good chance of winning the place a raise bet. If the cards are bad the player folds. Hands in this game are ranked in the same way as the common types of the game. But the ranking is stricter. When the dealer fails to get a queen high or better, the Ante bet is paid and the raise bet is returned. But when the dealer has a queen high or better but fails to beat the player’s hand the both bets are paid out. When the dealer’s queen high or better beats the players hand both bets are lost. When there is a draw the bets are returned.